Bells or chimestones, such a those found in Lord Yi's tomb, served as standard-setters for an orchestra, emitting notes to which the other instuments could be tuned. They also played to mark the beginning or the end of a performance. 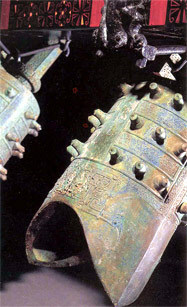 Bronze bells originated in south China. They were imported into the Zhou capital and the surrounding area halfway through the Western Zhou dynasty and appeared elsewhere in northern China at around the same time. Zhou court came to rely heavily on the use of these impressive instruments.